Many immigrants who have time-limited permission to live and work in the United States under a program known as Temporary Protected Status (TPS) face an uncertain future as the White House seeks to end their permission to stay in the country. Roughly 318,000 people currently have this protected status after fleeing their countries because of war, hurricanes, earthquakes or other extraordinary conditions that could make it dangerous for them to live in that country. Nearly all had been expected to lose their benefits either this year or next, although that now depends on the outcome of lawsuits challenging the government’s decision to terminate TPS benefits. Federal officials have said that TPS is meant to provide temporary rather than long-term relief. The Department of Homeland Security said last year that it would not extend Temporary Protected Status for immigrants from six of the 10 nations that are now eligible. Of those six nations, one – Nepal – faces TPS expiration this year. TPS had been scheduled to expire this year for four others – Sudan, Nicaragua, Haiti and El Salvador – but the government has extended it through Jan. 2, 2020, after being blocked in court. Also, immigrant advocates recently filed a separate lawsuit challenging the decision to end TPS for those from Nepal and Honduras. 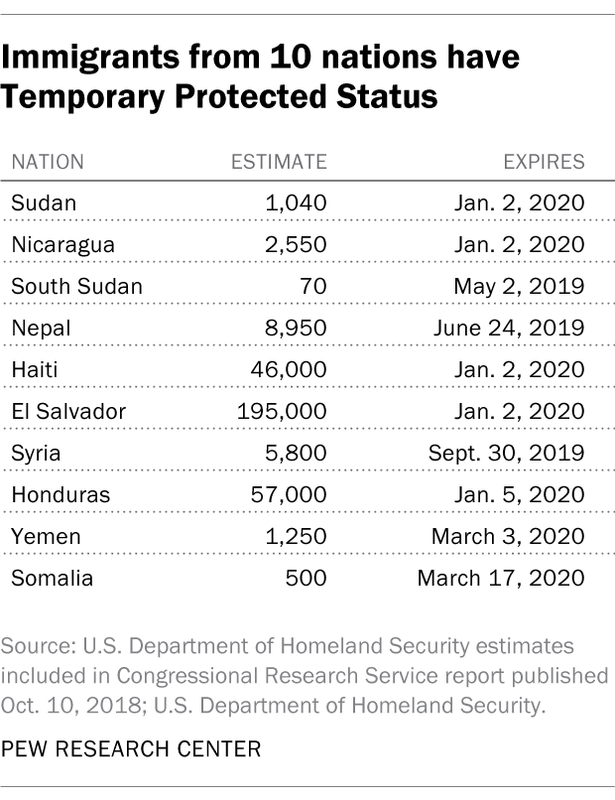 Only those from South Sudan, Syria, Yemen and Somalia have received TPS extensions with the possibility of future extension. Once the Department of Homeland Security designates a nation’s immigrants as eligible for Temporary Protected Status, immigrants may apply if they entered the U.S. without authorization or entered on a temporary visa that has expired. Applicants may also have a valid temporary visa or another non-immigrant status such as foreign student. To be granted TPS, applicants must meet filing deadlines, pay a fee and prove they have lived in the U.S. continuously since the events that triggered relief from deportation. They also must meet criminal-record requirements – for example, that they have not been convicted of any felony or two or more misdemeanors while in the U.S., or been engaged in persecuting others or terrorism. Temporary Protected Status does not make individuals automatically eligible for permanent residence or U.S. citizenship, but some may apply for permanent lawful status. Federal officials are required to announce 60 days before any TPS designation expires whether it will be extended; without a decision, it automatically extends six months. In 2016, there were 725,000 unauthorized immigrants from El Salvador living in the U.S., and about a quarter of these (27%) had Temporary Protected Status, according to Pew Research Center estimates. As of 2018, U.S. government officials estimate that 195,000 individuals from El Salvador have TPS. The Trump administration had said it would not extend TPS for Salvadorans beyond September of this year, but this decision has been temporarily blocked by a federal court and the administration has set a new deadline of Jan. 2, 2020. The current TPS for El Salvador applies to immigrants who have lived in the U.S. since Feb. 13, 2001, following a series of earthquakes that killed more than a thousand people and inflicted widespread damage. Recovery has been slowed by a series of problems, including “hurricanes and tropical storms, heavy rains and flooding, volcanic and seismic activity, an ongoing coffee rust [fungus disease] epidemic, and a prolonged regional drought that is impacting food security,” according to a Federal Register notice explaining why the designation has repeatedly been extended. The notice also cited increasing violence and high unemployment. El Salvador’s government has asked that TPS be extended. There were about 100,000 unauthorized immigrants from Haiti in the U.S. in 2016 overall, according to the Center’s estimates. U.S. government officials estimate about 46,000 Haitian immigrants have Temporary Protected Status as of 2018. 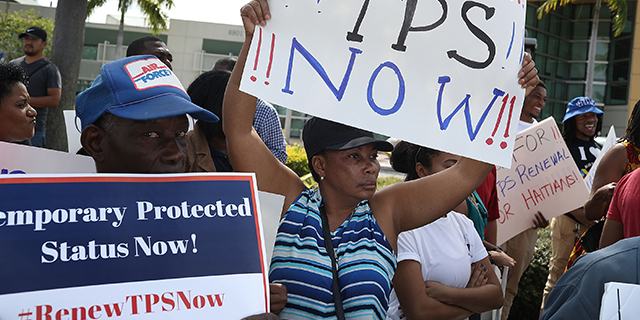 TPS benefits for Haitians had been set to expire July 22, with no plans for extension, but the Department of Homeland Security extended the deadline to Jan. 2, 2020, after being temporarily blocked by a federal court challenge. The TPS designation for Haiti was based on an earthquake that killed hundreds of thousands of people in January 2010. Immigrants also are eligible if they entered the U.S. up to a year later – so any Haitian immigrant with protected status has been in the U.S. since at least early 2011. In 2017, the Haitian government asked for an 18-month extension leading up to the July 22 termination, citing recent catastrophes including other hurricanes. There are 57,000 Hondurans and roughly 2,550 Nicaraguans with Temporary Protected Status, as of 2018 estimates. In 2016, there were an estimated 425,000 unauthorized immigrants from Honduras and around 70,000 from Nicaragua overall. Benefits expire for Nicaraguans (as well as for Sudanese) were to expire April 2, with no plans for extension, but were extended through Jan. 2, 2020, due to a court challenge. Benefits for Hondurans expire Jan. 5, 2020, with no plans for extension. Immigrants from Honduras and Nicaragua who qualify for TPS must have been living in the U.S. as of Dec. 30, 1998. Immigrants from both countries were designated eligible for TPS based on damage from Hurricane Mitch in 1998. The storm killed more than 5,600 people in Honduras and more than 3,000 in Nicaragua. The government of Honduras had also requested an extension of TPS. Damage in Honduras was at least $5 billion, and recovery has been hampered by tropical storms, drought and poverty, federal officials said when they last extended the TPS designation. In Nicaragua, damage was at least $1.3 billion, with a series of environmental disasters – including storms, earthquakes and a volcanic eruption – getting in the way of recovery efforts, federal officials said in extending that country’s TPS designation. Elaine Duke, then acting secretary of the Department of Homeland Security, said in a 2017 announcement that conditions in Nicaragua had improved enough that the TPS designation would be terminated in January 2019, but that has been extended to Jan. 2, 2020 as a result of an injunction by a U.S. District Court. Because of data limitations, Pew Research Center has not estimated the TPS share of unauthorized immigrants from the other six countries. They include Nepal (with 8,950 immigrants with TPS), Somalia (500), South Sudan (70), Sudan (1,040), Syria (5,800) and Yemen (1,250). Congress and President George H.W. Bush authorized the TPS program in the 1990 immigration law, granting the White House executive power to designate and extend the status to immigrants in the U.S. based on certain criteria. Note: This is an update of a post originally published Nov. 8, 2017. For the most recent information on Temporary Protected Status by country, see the Department of Homeland Security TPS page.